Ahem. Ok, I haven’t necessarily been dancing, but I didn’t break my legs either. Our lovely babysitter Karin came to watch little L for the afternoon and Big M took me out to Somerset Ice Rink on Strand. It’s got to be every girls dream: the man you love, music, skates, and a gigantic Tiffany box to walk in and buy cupcakes. That was fun. See you next winter, Somerset Ice Rink! Oh I am not a ice girly!! Sounds like a lovely romantic date! I took my son ice skating at the ice rink in our town centre a couple of weeks back. 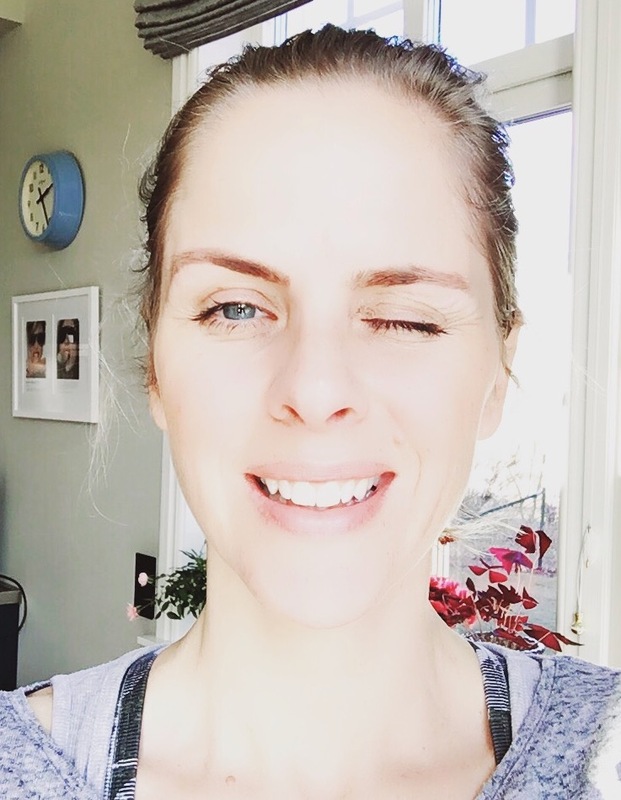 I fell so bloody hard on my bum that it was numb for 3 days after! Somerset House looks lovely. I think I’d be in the Tiffany box buying cupcakes, more than on the ice though! That looks like a fairy tale – how wonderful! Certainly unlike any of the skating rinks where I live. 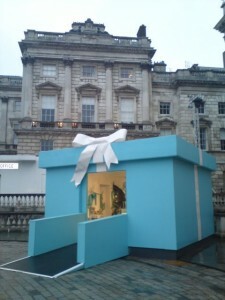 The Tiffany’s box is amazing – I would certainly have my fill of cupcakes there! For me the Somerset ice rink is the best in the city. I love it. Lovely pics. MM, you look like you can skate!! I would be clinging on around the outskirts. We were meant to go to Hampton Court ice skating but then eldest daughter came down with a bug that day. 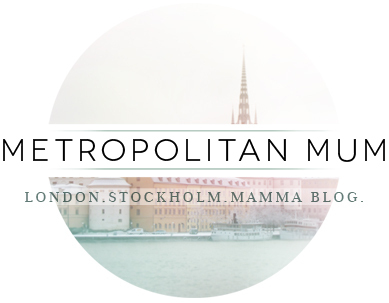 Next year…maybe we shall do Somerset House! That brings back good memories! Looks like fun – love the Tiffany’s cupcake store! I am SO jealous of that enormous Tiffany’s box AND it had cupcakes?? Amazing. Ooooh. How were the cupcakes? How fab! 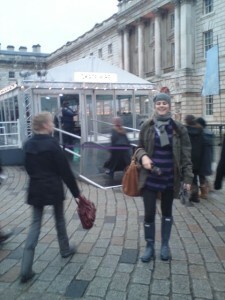 I so wanted to walk inside a giant Tiffany box…. and never come out again! @all the lovely ladies: funny how not a single guy commented on this post. Might have something to do with the content… Anyway, I didn’t get to try a single cupcake, because I went to a cupcake decorating course the very same morning, leaving me with a serious icing overdose and no desire for any more cupcake for the next 24 hours. 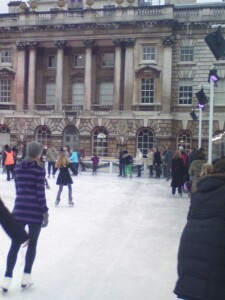 i’m a terrible skater but love somerset house skating nevertheless- it’s fun even hanging on to the side- anyone you can find! Not to diss ice skating, but the Tiffany box with the cupcake inside? Definitely the highlight. Ha I been there, that is. There are no decent cupcakes in Switzerland, dammit. Did I tell you you’d been tagged? Come on over to our place… The giant Tiffany box is the stuff of dreams, whoever planned it must have had a great time thinking it all up. After reading this post I must say that you have enjoyed a lot there.I also like ice skating but sometimes it is scary for me.I really like that you shared this with us.